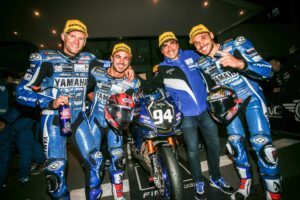 After a short break of two days, the team GMT94 Yamaha had to leave to Assen (Netherlands), for the 4th round of the World Supersport Championship. Corentin Perolari has been able to finish in 6th position whereas he was fighting in a group of five strong riders. Corentin was consistent, mature and leave Aragon at the 7th place of the World Supersport Championship. After an electronic test in Free Practice 3, GMT94 Yamaha was ready for the Superpole. Corentin Perolari has been able to improve during each session, while Jules Cluzel was focused on settings. GMT94 Yamaha has realised an interesting first day in Aragon (Spain), for the third round of the World Supersport Championship. The first free practice session took place in dry conditions. GMT94’s riders worked on worn tyres. Jules Cluzel ended in second position, Corentin Perolari nineth. Aragon D-3 : GMT94 Yamaha is setting up. Less than three days before the start of the third race of the World Supersport Championship. The GMT94 Yamaha team is well arrived in Aragon (Spain).